TNR -- TV News and Reviews: Cake Boss -- "A Blindfold, a Bikini, and Breathing Fire"
Cake Boss -- "A Blindfold, a Bikini, and Breathing Fire"
Mauro Castano works on the fire-breathing Tiki cake, on Cake Boss. Tonight's Cake Boss episode, "A Blindfold, a Bikini, and Breathing Fire", once again included two fantastic cakes and some light-hearted competition amongst the Cake Boss staff. First up was a client who throws a big birthday bash every year, and challenges Buddy to top himself each year with a bigger and more challenging cake design request. This year it's going to be a Tiki-themed party, and the client wants a Tiki mask cake with fire incorporated somehow. A fire-breathing cake is no easy task, but Buddy's got an inspired idea--to combine a real life firebreather with a cake Tiki mask. It's a complicated design, on a large cake that has to feed over 100 people. Buddy and his Cake Boss crew get to work making the cake, filling and icing it, and then building little Tiki idols and pinapples and tropical flowers. The centerpiece is a large Tiki mask, made with wooden supports covered in rice crispie treats and cake. Buddy inserts a metal cylinder into the Tiki mask's mouth, then covers the whole thing in icing and fondant--and strong wishes that it will all hold together. The finished cake is huge and dramatic, with lit torches at all four corners. The partygoers and client enjoy the cake, but Buddy is excited because he can tell they have no idea how much cooler (or hotter!) it's all going to get. When it's time to serve the cake, Buddy introduces the firebreather. This talented (and crazy, as Buddy claims) guy holds a flaming stick in front of the Tiki mask, then blows through the opening, making the flames erupt forth in a rush. It's a fantastic effect, and looks as if the Tiki mask is definitely breathing fire. The crowd goes wild, and Buddy is pleased that he's met yet another challenge. Daniella the artiste gets a lot of credit for the second Cake Boss project. Buddy introduces "My cousin Vinny" (Joe Pesci and Marisa Tomei, anyone? ), who's ordering a cake for his wife-to-be for the bridal shower. Vinny wants one of their signature "luggage" cakes, but it's not long before the bride's mother and sister (Buddy's mother-in-law and wife) show up to change the order. Buddy can't go against his wife, so he changes the order. He's upset that they didn't all consult together before placing the order, however. I feel sorry for Vinny, who seemed so excited about actually making some decisions about the cake's design. The shower is a jewelry theme, so Buddy sets Daniella up with an ornate jewelry stand--a gold frame and vintage style burgundy dress. Daniella went to art school and did a lot of sculpting there, so she's an expert with the modeling chocolate. She whips up a near-identical replica of the jewelry stand, with patterned cloth and gorgeous folds of material and little delicate flowers. Buddy is impressed, and it's the crowning jewel of the multi-tiered cake. The Cake Boss crew also whips up edible jewelry, a purse, and a gorgeous black high-heeled shoe to adorn the cake. There are screenprinted pictures and added embellishments and the cake is absolutely gorgeous. Buddy's happy that the cake fits perfectly into the party decor and that the guests all love the result. Even poor out-voted cousin Vinny. In the middle of all the hustle and bustle of Carlo's bakery, Buddy hears that Mauro's complaining about all the work to be done. Buddy chastises him for whining about an easy job like icing the cake, and says he could do it blindfolded. So they make a bet--if Buddy can ice a cake blindfolded, with a flower on top, Mauro has to don a grass skirt and coconut bra and serve pastries to the guests in the bakery. If Buddy can't, then he has to wear the skirt and bra. Mauro agrees. 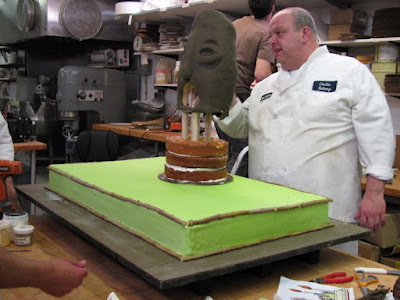 Despite all the work Mauro was complaining about, the Cake Boss crew gathers around as Buddy ices the cake blindfolded. He starts with a small, two-tier round cake. He gets the icing on the sides and the top, and smooths it all out. He then adds icing trim around the perimeter of the top tier. He gets definite oohs and ahhs of approval from the Cake Boss crew when he even forms a perfect flower for the top--and mounts it without screwing up any of the icing. The finished product isn't perfect, but it's shockingly good, and Mauro's forced to accept defeat. In a white tee-shirt and his white baker's pants, with an added grass skirt and shell bra, Mauro joins the rest of the crew downstairs to hand out Hawaiian leis and cupcakes. Everyone has a laugh, and Buddy is happily surprised by how well the customers respond. So a cake-frosting dare turns out to be an entertaining event for everyone at Carlo's Bakery. Watch Cake Boss on TLC, Monday nights at 10/9c. Check your local listings for encore showings of "A Blindfold, a Bikini, and Breathing Fire" and other repeat episodes. 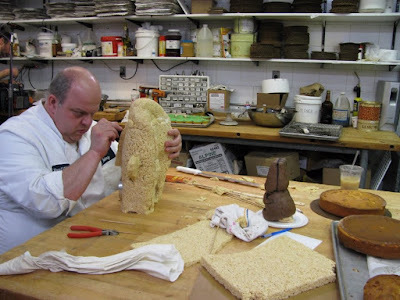 PHOTOS: Mauro Castano works on the Tiki cake, Cake Boss, c2009 Libby Klein, TLC; Daniella Storzillo sculpts a dragon head on a previous Cake Boss episode, screencap c2009 TLC. omg yes! i noticed that to, what he did was put water in his mouth and the he like spitted it through the hole! that was so gross and i said the same thing while watching it! WHAT HAPPENED TO DANIELLA STORZILLO IN SEASON 3.